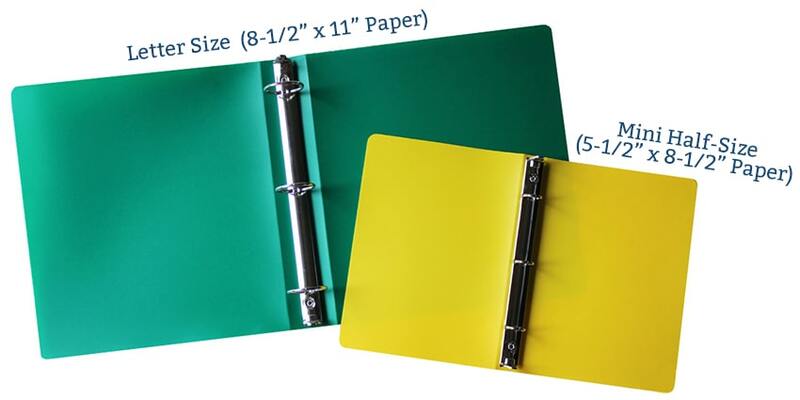 Mini binders will hold paper that measures 8.5" H x 5.5" W. Also called half size binders, these sheets measure exactly half of a letter size sheet. They combine a classic and practical paper storage solution with a more compact design that allows them to fit easily into bags, briefcases, boxes, and on shelves. At Binding101 we offer mini binders in two different styles: either view binders with clear pockets so you can slide in your own cover pages, or poly binders that are made of a durable and flexible plastic. Mini ring binders are most popular with churches, nature groups, and individuals making their own recipe books. They feature three rings that are spaced 2 ¾" apart and will keep your pages secured and protected. Ring sizes range from 1/2" to 2" and will hold as many as about 450 sheets of standard copy paper. Poly binders also come in different gauges, which is the actual thickness of the material; so you can get a flexible economy binder, a medium-weight standard binder, or a premium rigid and sturdy one, depending on your budget and intended use. No matter your choice, these mini ring binders are an excellent tool for organizing notes, presentation documents, assignments, recipes, music, references, and so much more.